Restaurant reservation providers are currently in a highly competitive race to deliver the best product on the market with each offering a variety of different features. The differences between providers can often seem confusing, so we wanted to highlight the features and services sophisticated restaurant owners and F&B directors look for when assessing front-of-house restaurant software and help create a better understanding of what buyers should be looking for. This article will provide you with the 9 questions you should ask when buying a restaurant reservation system. Pricing isn't everything when you consider other important factors such as key features and functionality, but with so many restaurant reservation systems to choose from, sometimes pricing could be the determining factor. Reservation systems don't abide by one singular pricing model, in fact, pricing models can be widely different from one system to another. For example, one provider could charge a flat monthly fee without a per cover charge, while another could charge a much lower monthly fee in addition to a per cover charge. At first glance, one system may seem cheaper than the other, but for restaurant's receiving a high number of reservations, these minor discrepancies can really add up. Aside from monthly subscription costs and per cover fees, there are a few other costs to bear in mind; namely installation and setup fees, sms charges, and tiered pricing which may limit functionality based on which one you are subscribed to. 2. Does it help receive online reservations? It's no secret that the rise of digital reservation systems has ushered in new customer behavior around booking tables online. In the US, more than 20% of all restaurant reservations are made online and international markets are catching up fast as the restaurant ecosystem continues to develop. As a result, almost all restaurant booking systems are accompanied by ‘booking widgets’ - a small piece of embeddable code that connects to your reservation book and allows customers to book tables online. Hence, you should always ask: will the reservation system help me increase online reservations? 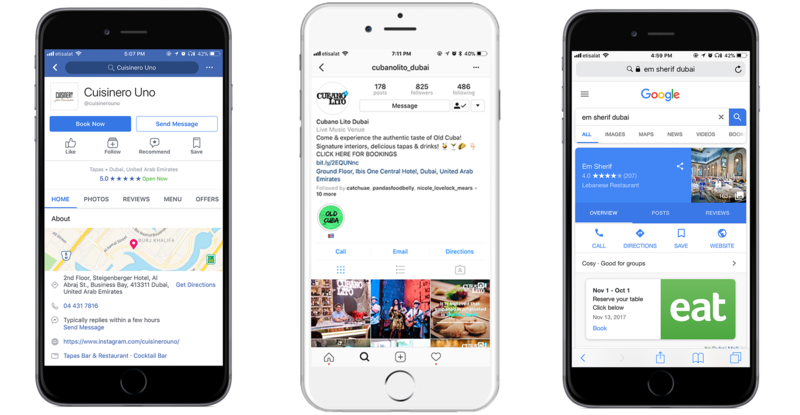 Today, as social networks and large technology platforms start to make restaurant websites less and-less important, booking widgets are now appearing across the web. Sophisticated buyers are keenly aware that reservation widgets must be flexible enough to cater to this ever changing environment, and built to generate reservations across the web, e.g. from Google Business Pages or Facebook, rather than just directing people to a website. Adding to the previous point on cost, the existence of a booking widget does not imply the system is right for your restaurant; there are some other factors to consider. Make sure you understand how much you will be charged per booking generated from the booking widgets. Some companies don’t have a booking widget fee, some don’t charge if the reservations come from your own website, while others charge for bookings generated across the web regardless of origin. 3. Will it help me reduce no shows? Short of collecting deposits from every customer that has reserved a table at your restaurant, it is very difficult to ensure every guest arrives. And with profit margins as low as they are in the restaurant industry, even a couple of cancellations can push your restaurant in the negative. In big cities, one in five reservations result in a no-show. Celebrity Chef Gordon Ramsay knows this, and charges $75 pounds when a guest cancels their dinner reservations. So you need to be asking yourself: can this system help me reduce no shows? Most modern restaurant reservation systems know that no-shows are a problem plaguing the restaurant industry and so take measures to help prevent it from happening. Before choosing a reservation system, make sure the one you settle for has preventative no show measures. Features such as SMS messaging, email notifications, and push notification reminders help reduce no shows across the board. When those fail, your reservation system should have a system in place to tag guests so if they happen to book a table again in the future, you are prepared. 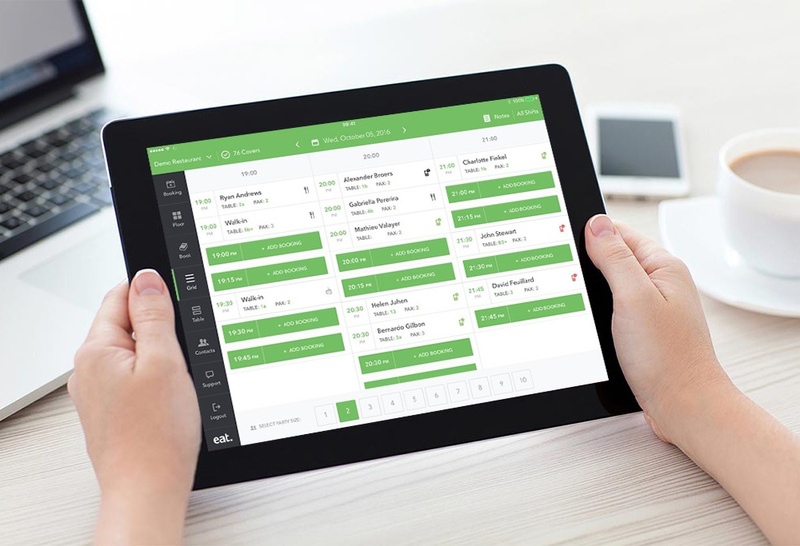 While this might be more important for some restaurants than others, it is important to consider the portability of your restaurant reservation system. Some systems require bulky hardware mounted by the hostess stand, while others run on handheld devices allowing for reservation management from anywhere in the restaurant. 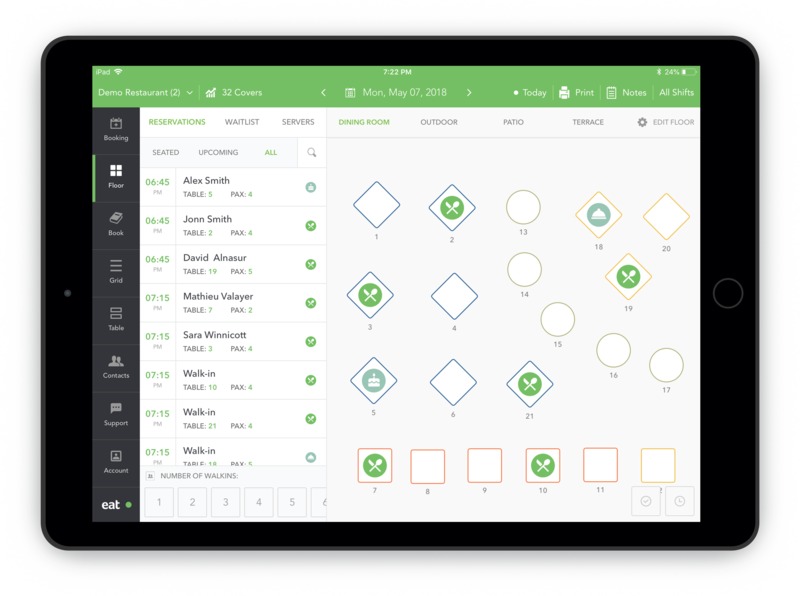 If you are the owner of a busy restaurant, it is extremely helpful to have a restaurant reservation system that allows you to manage reservations and tables freely, without restricting you to the front of your restaurant. Always make sure to ask if the system is portable, and additionally, does it allow for multiple devices to be used? Most of the time, the platform the reservation system runs on should be enough to tell you how portable it is. If it only runs on a computer, it’s going to be rather difficult to carry a laptop around the restaurant as you seat guests and change their tables. The most helpful feature of a portable reservation system is the fact that you don’t have to be physically present in the restaurant to manage and create reservations. Do you have an angry customer on the phone demanding their reservation time be changed? No problem, you can change the booking from wherever you are. What about when your restaurant is fully booked, or already at full capacity and guests are walking in requesting tables? How will the system help with waitlisting? When your restaurant is at full capacity, your reservation system should be able to easily put together a waitlist. A list alone is not enough though, a list in combination with timers and sms alerts is ideal to efficiently tackle a busy night at your restaurant. 6. Can it help manage capacity at my restaurant? For restaurant managers and owners, a key part of managing front-of-house is balancing the supply of the kitchen with menu items with the demand of guests for those dishes. Per hour, restaurant kitchens have a limited number of covers they can produce food for. Take too many walk-ins in a short space of time and the kitchen becomes overwhelmed and diners unhappy about the wait times. For busy restaurants, successful table management and customer service, often hinges on being able to accurately match the capacity of the kitchen with the volume of incoming diners and reservations. A decent reservation system should have at least one feature to help you manage the number of guests you seat per hour to prevent any issues. 7. How easy is it to use? How easy a restaurant reservation system is to use is somewhat dependent on the user themselves. But you should always ask the reservation software provider if they allow for a trial period to see how you truly feel about the product. In that time, get familiar with the user interface. Find out if the software is designed in a way that is easy to use and makes sense. Check out the company’s support page, see if they have tutorial videos, help documents, or provide free customer support. Down the road you may need help troubleshooting a problem, and it is important to know that they won’t leave you out to dry when you need them most. 8. Can I personalize my experience? What about my guest’s experience? Can I personalize my experience? You don’t want a cookie cutter reservation system that doesn’t offer you customization options. At the very least, a restaurant operator should be able to customize their floor plan, add extra rooms (terrace, bar, outdoor seating), and customize their opening hours. What about my guest’s experience? Customization is not only important for you, but also for your guests. A decent reservation system should be able to send custom sms’s and emails to your customers. You should also be able to build a customer database, so that if a regular shows up you know when their birthday is, what their favorite dish is, and most importantly their allergies. Can it build my customer database? Few restaurant owners realize this, but a good reservation system should not just help you manage your tables, but it should aid in your restaurant marketing efforts. By putting together a customer database, you are ultimately generating an email marketing list, that you can use to email offers, remind guests to come by, or promote special one off events. This last requirement is not so much a requirement but more so a huge advantage. Some reservation systems have strategic partnerships in the restaurant space, meaning restaurants using their system can take advantage of this. How can this system increase my reservations with partnerships? Using a table management system that is partnered with TripAdvisor for example means that tourists visiting your city will be able to find your restaurant on the TripAdvisor website and mobile app and make a table reservation without even needing to visit your website or call. This is a game changer for tourists that aren’t familiar with the city they are visiting but need a place to eat. With these 9 questions in mind, you should be able to make a better decision when it comes to purchasing a restaurant reservation system. Still having trouble? Download our free buyer's guide to reservation systems to help you make an educated decision.